We always visit Habitat when we are in the area on holiday. Excellent teas, coffes, hot chocolates, cakes and sandwiches. We, along with Brodie our Scottie, are always made very welcome. Brodie loves his complimentary water and treats whilst sitting under the table watching the world go by in the square outside. Will be back soon! Great cafe – good food and friendly staff. 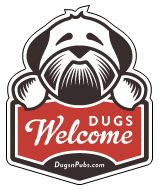 Dugs Welcome sticker now proudly displayed. Fantastic cafe, very dog friendly. We had a huge bowl of home made soup, excellent!